Giving to Southern Wesleyan is easy! We offer several convenient options for making a gift. Give towards the general fund or towards specific memorials or causes. You can give online using our secure electronic form. In the online form, you will be able to note the fund or memorial you are giving towards. Thank you for your interest in supporting Southern Wesleyan! We’re excited about our mission to transform lives by challenging students to be dedicated scholars and servant-leaders who impact the world for Christ. Our mission has not changed: we remain dedicated to educating and nurturing students as they seek God’s plan for their lives. Your support is an investment in this mission, in Southern Wesleyan, and in the life achievements and spiritual growth of our students. Fulfilling our mission wouldn’t be possible without your prayers and support. We would love to partner with you to make an even bigger difference in their lives. Learn more about how you can partner with us to prepare the next generation to fulfill God’s calling on their lives. The gap between diminishing State and Federal Aid is growing at alarming rates. Giving to the Promise Fund begins to bridge that gap for hundreds of students. Your annual gift provides ONGOING scholarship support for students; keeping them in college to graduation! Your support shows that SWU is a good investment and any gift is a gift that keeps on giving, turning recipients into future givers themselves! You can directly impact the futures of students as they fulfill God’s plans for their lives. Forecasters predict that as many as 30 percent of private institutions of higher education will not survive this decade. Yet those serving a stable number of traditional-aged students, as well as a large non-traditional student enrollment, have a very bright future. Southern Wesleyan falls into this fortunate group. For more information, please contact the SWU Office of Advancement at (855) 644-5008 or . Celebrating the first 70 years. Preparing for the next 70 years. We have an exciting opportunity to preserve the history and heritage of Childs Hall and help continue the enrollment growth of Southern Wesleyan to see more lives impacted for Christ. The Promise Fund provides critical support for student scholarships. Many students would not be able to attend SWU if it were not for the generosity of friends and alumni willing to invest in the next generation of student leaders! A planned gift is a charitable gift that is funded either during your lifetime or after. In addition to tax advantages, a planned gift allows you to dictate how certain assets are distributed and to know that you’ve made a difference. Through your generosity, you’ll leave a legacy, help future SWU students and enhance the caliber of Southern Wesleyan. Let your name mark the way for generations to come. Our Alumni Walk—a path every future SWU grad will travel—will be paved with bricks engraved with the names and class years of our graduates, and other inspiring messages contributed by alumni and the family members. Southern Wesleyan University is pleased to announce it is partnering with Amazon through AmazonSmile, an exciting new initiative in which the major online retailer will donate a percentage of its sales from our many alumni, friends and others to the university’s scholarship programs. When purchasing through Amazon, a half percent (0.5%) of eligible purchases will come back to the university to benefit its programs. To participate, simply click on the link at right. 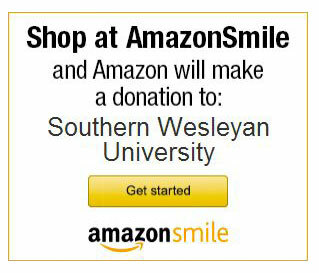 From that point on, the page for SWU will come up each time you enter the smile.amazon site. For more details about the program, go to https://org.amazon.com/. If you don’t have an Amazon account, signing up is free. Also, help us spread the word on Twitter and Facebook! With the list of needs in printed form we are asking friends of SWU to partner with us in identifying one or more of these needs. We recognize that most of us individually are not equipped to meet most of the needs found in this catalog, but collectively if we all join forces with family, friends and co-workers, much can be accomplished.